Girolamo di Francesco di Mariotto Macchietti (Girolamo del Crocifissaio), Italian Mannerist painter. He trained in Florence with Michele Tosini, whose studio he left c. 1556 to work for six years under Vasari on the redecoration of the Palazzo Vecchio, Florence; there he was apparently employed as a designer of tapestries. This was followed by two years of study in Rome. By 1563 he had returned to Florence, where he became a member of the newly founded Accademia del Disegno. Under the academy s auspices he collaborated in 1564 with his friend Mirabello Cavalori on a grisaille painting of Lorenzo de Medici Receiving Michelangelo (untraced) for the catafalque of Michelangelo s funeral in S Lorenzo, Florence. For the academy s next major project, the decorations for Duke Francesco I de Medici s wedding in 1565 to Joanna of Austria (1547-78), Macchietti contributed a monochrome painting of the Establishment of the Monastery of Monte Oliveto Maggiore (untraced) towards a festive Arch of Religion . He participated in the Vasari-directed decoration of the Studiolo of Francesco I with two canvases, one relating a Jason and Medea (1570) and the other a Baths at Pozzuoli (1572). 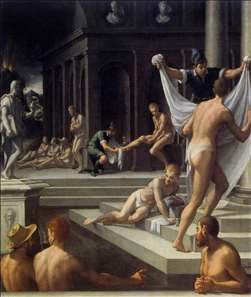 He also painted an altarpiece on the Martyrdom of Saint Lawrence for Santa Maria Novella. In 1577, he completed a Gloria di San Lorenzo for Empoli Cathedral. He traveled to Rome and spent two years in Spain (1587-1589). No works are recorded from these travels. See more details about "Baths at Pozzuoli"